“How do we posture for future conflicts while dealing with the conflicts that we’re already in?” Mr. Garry Reid, the U.S. Director of Intelligence, posed this question as part of his remarks during today’s “Leading the Geospatial Intelligence Revolution” Panel. It was one of many discussion questions that led to some insightful conversations during the first day of the Global SOF Symposium. Since we had over 250 attendees join us for Monday’s Icebreaker Reception and 45 for our inaugural Golf Tournament, today kicked off with a flurry of familiar handshakes and conversations picked back up from the night before. After a bit of coffee and networking, we convened in the beautiful Inverness Ballroom for opening remarks from GSF President, Stu Bradin, and an introduction to our Master of Ceremonies, Brig Gen (Ret) Lance Mans. 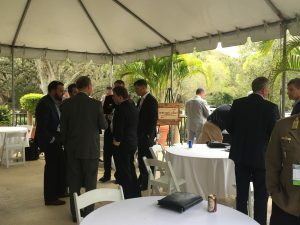 As Stu stated in his opening remarks, “GSF events are all about meeting people you don’t know.” For that reason, we provide lengthy networking breaks throughout the day. We kicked off the first of those events next, with a coffee break sponsored by Fluor. Attendees had the opportunity to get some caffeine and tour the Networking Lounges within the foyer. These lounges are sponsored by companies that want a comfortable space to meet with potential clients, partners, or even friends. 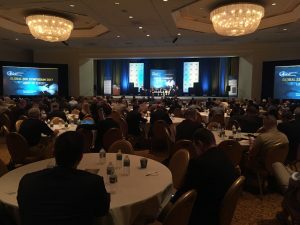 Next we kicked off our first session of concurrent panels: one focused on geospatial intelligence and another focused on next generation communications. 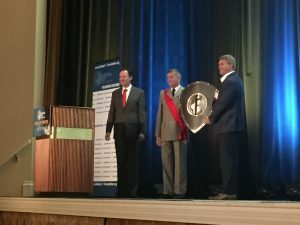 With panelists from ranging from Rear Admiral Nils Johan Holte, of Norway, to Mr. Tony Frazier, a senior VP with our Corporate Partner and Gold Sponsor DigitalGlobe, these topics were tackled from many perspectives and with audience questions down to the buzzer. While everyone is always excited to hear that it’s time to eat, lunchtime today brought more than just a delicious Mexican buffet. We also tapped the keg at our first ever Beer Garden, sponsored by our Small Business Partner System High Corporation. Beer translates into every language, and the Beer Garden provide another casual environment in which attendees could network. The ballroom was packed again after lunch, as everyone took their seats to listen to remarks from today’s Keynote Speaker, Admiral Kurt Tidd, of USSOUTHCOM. Captain (Ret) Todd DeGhetto, from GSF Founding Partner and Platinum Sponsor General Dynamics, represented his company well with a wonderful introduction for the Admiral. Admiral Tidd then spoke on the SOF perspective from a South American perspective, providing remarks that were both educational and focused on the path forward. He impressed upon the crowd that the biggest issue in the SOUTHCOM Area of Operations (AOR) is not drugs, as most people suspect, but actually threat networks. Keeping in the theme of what the future holds for SOF, our next panel brought in Mr. Michael Durant, Mr. Keith Flail, Major General Clay Hutmacher, and Major Sebastien Pistre to discuss the future of SOF aviation. Many current issues were identified, ranging from costs to what Major General Hutmacher called “unacceptable” false alarm rates for threat detectors on rotary wing aircraft. Overall, the panelists had a positive outlook and high hopes for the future of aviation for Special Operations. While the events at Inverness Hall have ended for the day, it’s not over yet—we’re heading off to a Poolside Reception sponsored by our Founding Partner, CACI. We’re looking forward to food, drinks, and a chance to mingle with the 50+ participants of today’s SOF for Life Seminar, which was hosted by The Honor Foundation and ran concurrently with our program. Those active duty or recently transitioned members of the SOF community will be armed with new knowledge about their post-military careers and ready to network with our industry and government attendees. We’ll see everyone tomorrow…stay tuned!